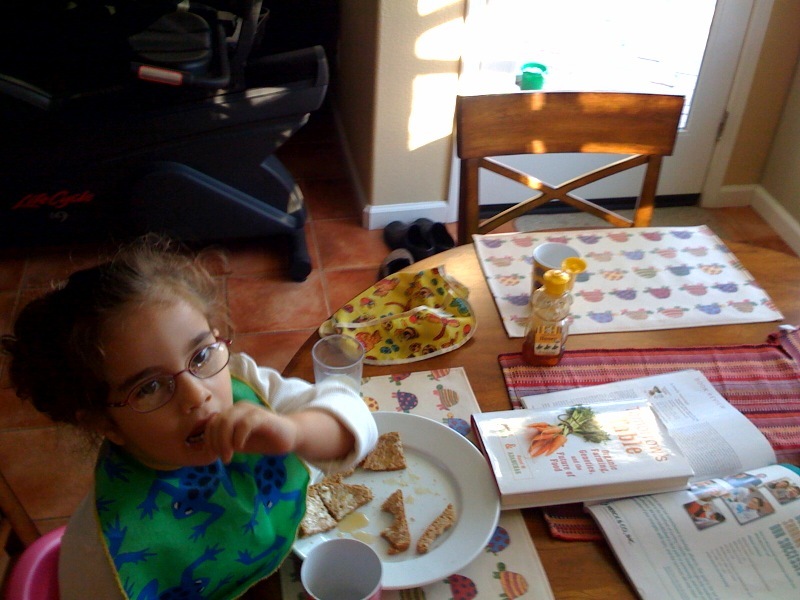 So – I was having breakfast with my daughter this morning and she was in a funky mood. She wanted some stories so to make life easy and not get up, I opened up the only thing near the table to read – a copy of Nature Biotechnology that I received for free in the mail (not sure why) – and was going to show her some pictures of things. And there was a review of my friend and colleague Pam Ronald’s book “Tomorrow’ Table.” And so I told my daughter that this was a story about a book by my friend Pam and reminded her about how we had gone over to Pam’s house and how she worked in the office next to mine. And then I asked my daughter if she wanted to see Pam’s book, which I had in the office and she said yes. And so I got the book and then we told stories about Pam. So – here in living color is a picture of my daughter and Tomorrow’s Table the book and the review of Tomorrow’s Table on my table, today.